There is something about Grand Dames that is so fascinating. Ladies of a certain age who have conquered their field and who seem to get stronger and better with each passing year. 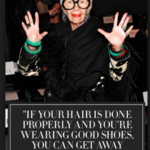 Right up there with the cream of the crop is the extraordinary Iris Apfel!! You may not be that familiar with the name but I’ll bet you have seen her image around. Her signature look of enormous framed glasses and brightly coloured and patterned clothing with heaps of disparate accessories on a tiny frame means that she is not easy to ignore. 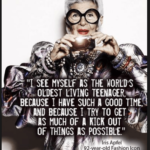 The Lady is well into her nineties and just getting better. Born in 1921 in America to a father whose family owned a glass and mirror business and a Russian born mother who owned a fashion boutique. Her mum was really ahead of her times – opening her own boutique during the years of the great depression and working long hours to make it work.From both her parents she learned a strong work ethic and a passion for fashion and interior design. 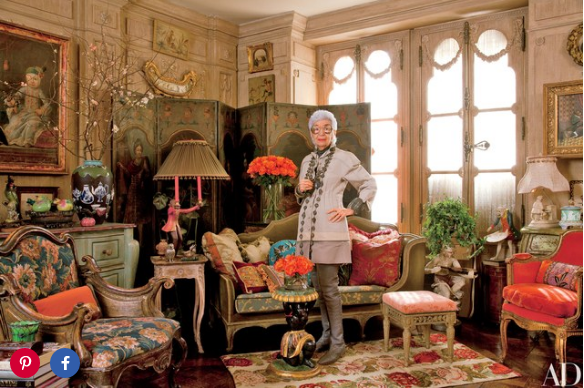 Iris studied Art History and went on to work for Women’s Wear Daily and for interior designer Elinor Johnson. in 1948 she married Carl Apfel and they were married till his death in 2015. The secret to their long and enduring marriage, Iris suggests, is a sense of humour. With an interior design business already established the couple began sourcing fabrics and vintage pieces from the Souks of North Africa to European flea markets for some of America’s most well to do homes. Soon demand meant that the dwindling supplies of textile rarities could not serve projects for a growing clientele that came to include the likes of Estée Lauder and Greta Garbo. Then quite by chance Iris took a design of her own fabric that she wanted to have weaved to a fabric weaver. He loved the design and in 1950 Old World Weavers was born. The company was set up to replicate the historic fabrics they found on their travels. They sourced the specialist looms and weavers needed to recreate them wherever in the world they were. This business was run by the husband wife team till they retired in 1992 and became a leading luxury fabric company using old word methods to create the most extraordinary fabrics. The couple did work for the Met as well as very important work for the White house for 9 of its presidents including Truman, Eisenhower, Nixon, Kennedy, Johnson, Carter, Reagan, and Clinton. 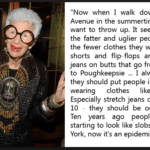 In 2005, the Metropolitan Museum of Art in New York City premiered an exhibition about Apfel titled Rara Avis (Rare Bird): The Irreverent Iris Apfel. 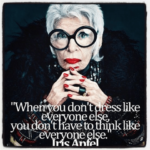 Apfel still consults and lectures about style and other fashion topics at he University of Texas where she was made a professor and is busy with several other projects: her Mac cosmetics line, her work for Eye-Bobs and Yoox. in 2012 she launched her own line of handbags: Extinctions.